>Long before I was pregnant with my first child, I had a vision of what motherhood would be like. I pictured myself with a spotless white apron, calmly guiding the hand of my rosy cheeked daughter as she stirred a copper pot with a wooden spoon. The kitchen was neat. There were no piles in sight. And as we cooked together, we sang (in perfect pitch), songs from the Sound of Music. My cooking sessions with the kids are a far cry from that dream, but they are a frequent reality. Our aprons are stained and the kitchen is usually messy, but we do a lot of cooking together. Letting the kids create food is my type of crafting, something I can teach them, just like my mother taught me. I’m always looking for kid-friendly cookbooks to inspire them to try new dishes and I recently received two new cookbooks to review that got our creativity flowing in very different ways. This very pink cookbook has become nightly bedtime reading. Juliette and I flip through the adorable illustrations and decide what we’ll make for lunch the next day. 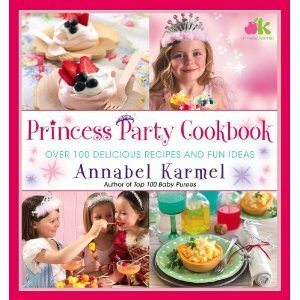 Think of it as a way to transform your little girl’s food into Fancy Nancy food. It is filled with creative presentation ideas like kiwis cut into flowers topped with a red raspberry, or using a hollowed out pumpkin filled with creamy cheese risotto to act out Cinderella’s coach. But don’t let the pink cover fool you, there are foods for beach princesses, and rock star princesses that will appeal to girls that have outgrown the Disney princess crazy for pink stage. 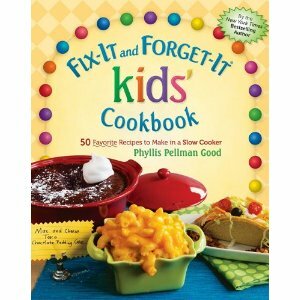 This cookbook is more geared towards elementary aged children who are showing an interest in cooking. There are many recipes that your child will recognize (meatloaf, tacos, baked potatoes) but thanks to the gorgeous photography and fun presentation, they’ll be intrigued to make them with you. Who could resist the Tasty Tomato Soup topped with rainbow goldfish crackers? I love that every dish is easy and uses the slow cooker, filling the house with amazing smells and keeping short attention spans engaged.